Coriolanus is a modern adaptation of a little-known, Shakespeare play. Like Baz Luhrmann’s take on The Bard’s Romeo & Juliet, here the viewer is offered a Shakespearian tragedy with old English dialogue and a modern setting thanks to little twists like news stories on TV and modern warfare raging against the ancient politics underpinning the story. 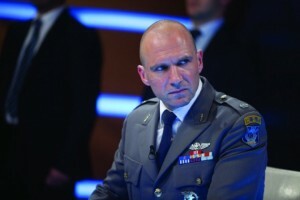 Caius Martius or Coriolanus is portrayed by Ralph Fiennes who is also making his directorial debut with the film. Fiennes along with Vanessa Redgrave are the standouts in this cast, with the latter playing the over-bearing and controlling mother, Volumnia, of the former. The story proves that history continues to repeat because the opening scenes show two sides locked in war. Coriolanus is fighting against the Volscians, the enemy and a group responsible for causing almost 30 scars on his body, one for every enemy he killed. It therefore goes without saying that the first act features plenty of blood and gore and a knife fight amongst the action-fuelled, combat scenes. Initially Coriolanus returns home as a decorated war hero. But thanks to Volumnia’s interference, he runs for political office with no success. The result is the city uprises and the star responds with some tough-guy brutality and stubbornness and is eventually banished for his troubles. At the hands of such ill treatment from his city (not to mention his family), Coriolanus defects to the opponents’ side, the one headed by his previously sworn enemy, Tullus Aufidius (Gerard Butler). In this new environment, Coriolanus morphs from man to dragon – his spirit is heartless, cruel and light-years away from the noble soldier he once was. From here, the viewer witnesses a gritty drama about political tussles that is played out in violent and revenge-fuelled glory. Ultimately, Coriolanus is an uneven tale that lags in the middle act before coming together for a punchy ending where the themes of betrayal and dishonour are played out in an almost bleak fight to the death. It is vicious, ferocious and filled with anger and thus, in some ways it is obvious why it lacks the appeal of Shakespeare’s more universal and relatable magnum opus. But you’ve got to hand it to Fiennes and Co. for putting up one darned good fight. This entry was posted in Film and tagged betrayal, Caius Martius, coriolanus, dishonour, enemy, fighting, film, film review, Gerard Butler, politics, Ralph Fiennes, Shakespeare, Vanessa Redgrave, Volumnia, war, warfare. Bookmark the permalink.